This piece of equipment was designed with innovation and accuracy in mind, enhancing the overall turf maintenance experience. John Deere announced that it has launched its latest GPS PrecisionSprayer, available exclusively on the John Deere ProGator line. The equipment will also debut at the Golf Industry Show in San Diego, California, from February 6-7. Deere will be located at Booth 3037 between the Gaslamp District and Bayside of the venue. 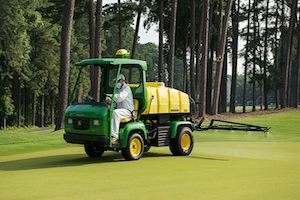 "The GPS PrecisionSprayer offers an innovative solution that allows our customers to be more productive and accurate when maintaining turf," said Brooks Hastings, product manager, John Deere. "John Deere boasts over 20 years of GPS experience, which was vital when creating the GPS PrecisionSprayer. We were able to leverage our knowledge of GPS technology to develop a solution that supports our customers, increasing productivity and accuracy, and reducing labor and material costs." Some of the features the GPS PrecisionSprayer includes are AutoTrac, shareable coverage maps, and individual nozzle control. With AutoTrac, operators can spray predetermined areas in less time with greater pass-to-pass accuracy. Individual nozzle control means that operators can minimize application errors and reduce fatigue, as they do not need to focus on manually turning boom sections on and off. Shareable coverage maps mean that operators can eliminate overlap and increase productivity. The GPS PrecisionSprayer utilizes advanced satellite technology to ensure the reliability of boundary maps as well. For more information about the GPS PrecisionSprayer or insight into other equipment available exclusively on the John Deere ProGator line, visit www.Deere.com, or speak to your local John Deere Golf distributor.